Princess Victoria Alexandra Olga Mary, fourth child and second daughter of the Prince and Princess of Wales (later King Edward VII and Queen Alexandra) was born at Marlborough House on July 6, 1868. To distinguish her from the many relatives who bore the name Victoria, she was nicknamed 'Toria'. On the insistence of their father, the children had a more relaxed, happy and carefree upbringing; however, it greatly lacked in discipline. Queen Victoria found the children to be "such ill-bred, ill-trained children, that I can't fancy them at all." Of the five unruly, mischievous Wales children, Victoria was considered to be the most intelligent. She was reported as very sharp, quick, merry, amusing, and at times exceedingly naughty. 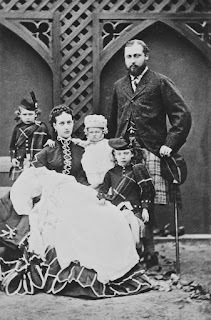 Their mother, Princess Alexandra wanted to keep them as children for as long as possible and they were isolated from other people, which resulted in the children forming a very tight unit. Victoria and her sisters, Princesses Louise and Maud (later Queen of Norway), were dressed alike and were known as the 'whispering Wales girls'. Victoria was a hypochondriac, had a sharp tongue and her childhood of running wild with her siblings lead her to have an inflated sense of her own importance. 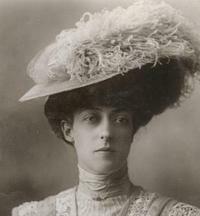 She never married, remaining as a companion to her mother, with whom she lived until Queen Alexandra's death in 1925. Although she played the dutiful daughter, the sacrifice to her happiness lead her to be extremely bitter. She had two romances but in those days, neither of her commoner suitors would have been acceptable as a spouse. When Princess May of Teck (later Queen Mary) married her favourite brother, George, she classified her sister-in-law as boring and took to apologizing to those who ended up sitting next to her at dinner. Envying her happy marriage, Toria made life difficult for Mary at every possible opportunity, claiming back items of furniture and jewellery she claimed belonged to her. After her mother's death, she then set up her own household at Coppins, Iver, in Buckinghamshire, where she devoted herself to her main recreations of music, gardening and photography - an interest she inherited from her parents. She was extremely close to her brother, King George V and they had daily telephone calls. "Every morning I rang up my sister at half past nine, just to have a chat. Of course we are not always too polite. One morning her telephone rang at the usual time, and she took up the receiver and said 'Hullo, you old fool' and the voice of the operator broke in, 'Beg your pardon, Your Royal Highness, His Majesty is not yet on the line.' "
When she died in December 1935 he was devastated. The loss of this favourite sister proved a blow from which he never recovered and he died just over a month later. Question: Does the Queen wear wigs? May not be reproduced without the author's permission.